This morning we ventured to Pablo Rusty's Coffee Roasters in the Sydney CBD ANZ building, locally known as 161. If you're after great coffee and a meal to satisfy, but so little time to do so? 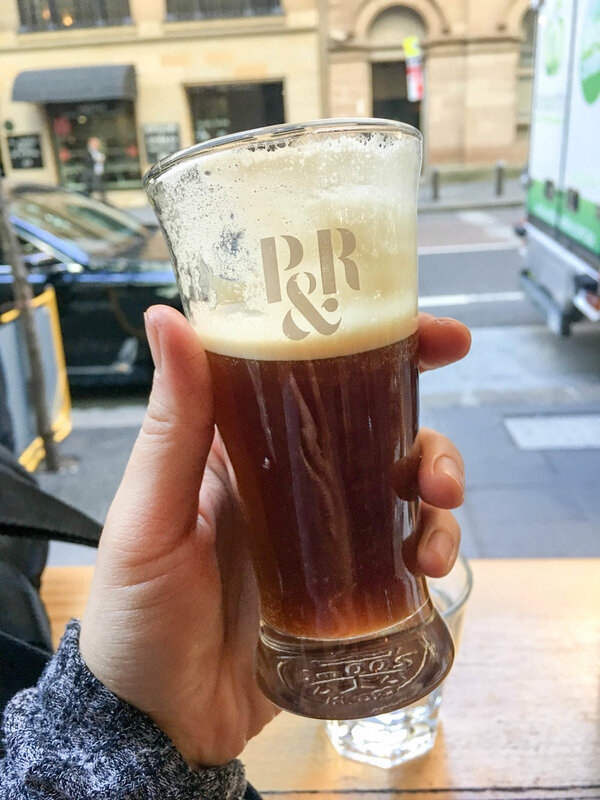 This is EXACTLY the place for you, because Pablo and Rusty's on 161 Castlereigh Street have mastered the art of service and F&B quality to truly hit the spot, and you can still make your meeting, bus, class, whatever you need to get going to in a dash. 161 has a warm and cozy industrial feel. The tepid tones of the stained wood and rustic brick entice an invitation away from the cold snaps of Sydney climate. The staff were pleasant, and despite the hustle of the morning peak trade they were friendly and seemed relaxed under pressure. 161 have one door dedicated to takeaway coffees and another door for table service. It was very busy but we didn't have to wait long, the staff were very attentive and saw to us immediately. Today I drank the Nitro. 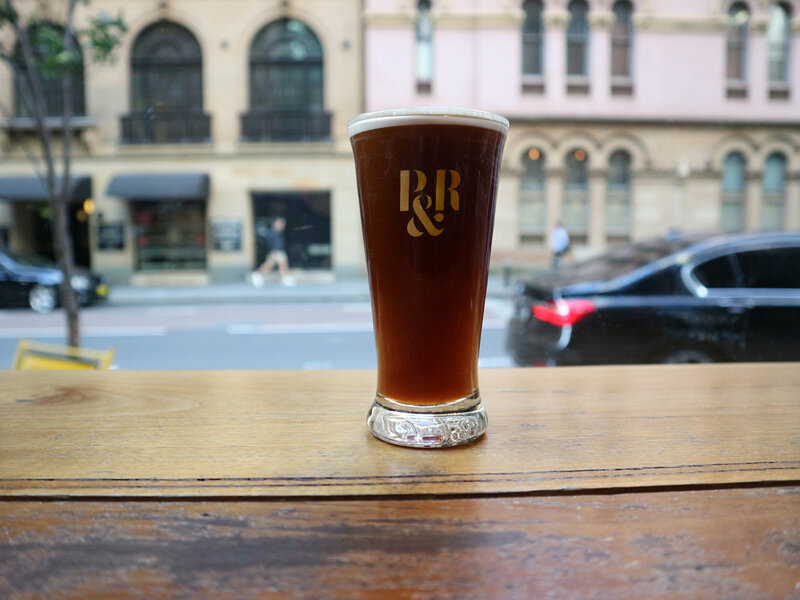 Nitro cold brew coffee, commonly referred to as "NCB," is cold brew coffee infused with nitrogen to give it a rich, creamy head, similar to nitro draft beer. You might remember I had one in Melbourne at Aunty Peg's, and I fell in love with the drink and have been pining for a glass ever since. Today I ate the Pork & bean fabada with hot chorizo, guanciale (Italian cured meat), butifarra (Catalan sausage), smoked belly, poached eggs, piquillo (a variety of capsicum) w/ fennel, parsley pickle & almonds. 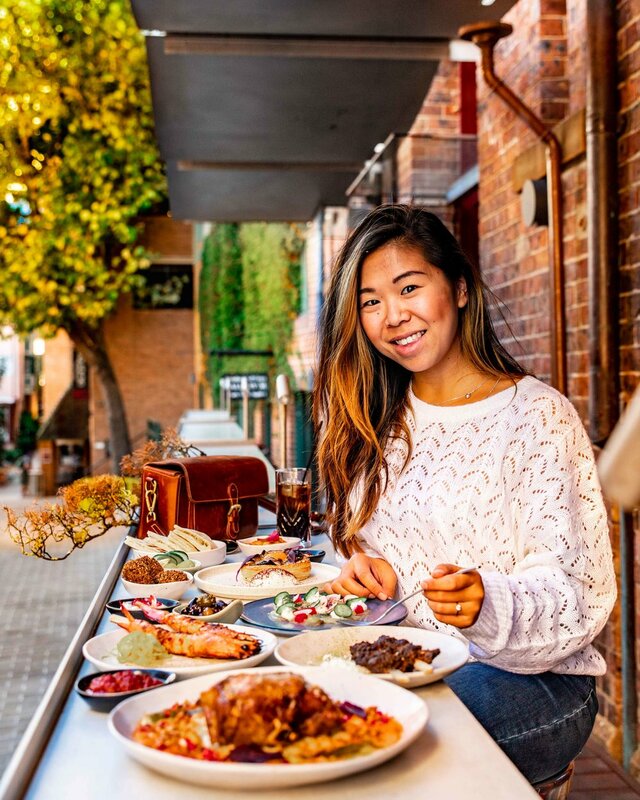 Spanish cuisine is one of my favourites, I never say no to a cool gazpacho or a hearty paella. 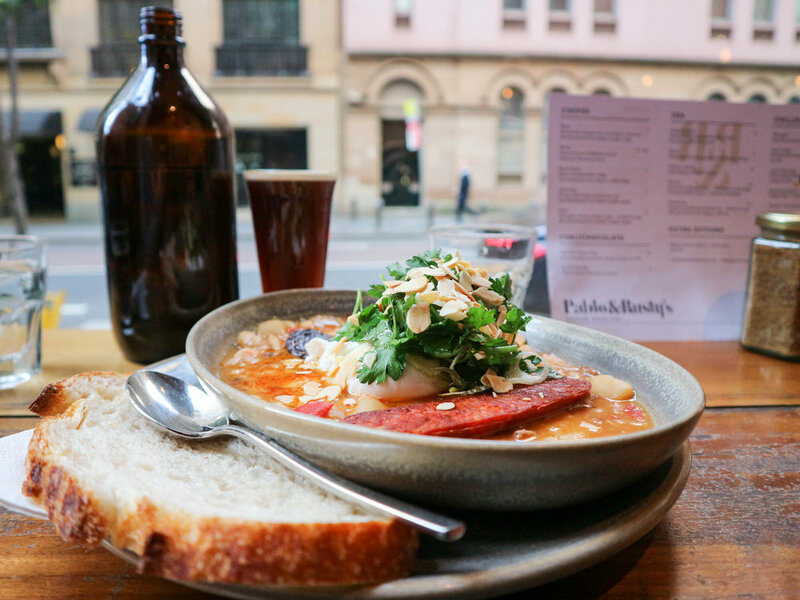 A fabada is a rich Spanish bean stew, commonly served with black pudding, chorizo, bacon, and beans. It sort of reminded me of a cross between the paella and a cassoulet, a French casserole. It was warming, comforting, and very delicious, though I wish I had some butter with my bread, only because I love and I believe it is a sin to have bread without butter. There's something to be said about a company that roasts their own coffee. This is not to say that cafes that don't do this is any lesser, but it's always an added bonus to try a product that is inherently different to anybody else's. 161 have a board on their wall listing their coffee beans by type, region, and tasting notes, making it easier for us to choose what we wanted to try that day. Mr. Cardi is getting into his black coffees, even training his palette to taste fruits, florals, and toastiness. This morning, however, even the I the barista failed to guess the mango and red berries of the Ethiopian. Nonetheless, the coffee was absolutely perfect. Aromatic, smooth, balanced, fruity, and lots of body - I would definitely have a coffee from there again! Thumbs up to Pablo & Rusty's 161. Keep exploring to find your next favourite! Hey guys! I'm back on Zomato!